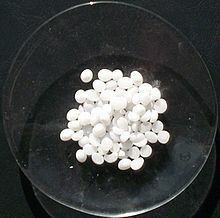 Potassium hydroxide is a chemical compound. Its chemical formula is KOH. It contains potassium and hydroxide ions. It is a white powder. It dissolves easily in water to make a basic solution. It is corrosive to skin. It reacts with acids to give potassium salts. It is less common than sodium hydroxide. About 700,000 tons are made each year. It is hygroscopic, meaning that it absorbs water from the air and forms a solution. It is very hard to get the water out again. It releases heat when it is dissolved in water, similar to sodium hydroxide. It gradually reacts with carbon dioxide in the air to form potassium carbonate. It melts easily. It feels greasy when it gets on the skin because it makes soap from the fat in your skin. It is made when potassium reacts with water. It is made by electrolysis of a potassium chloride solution. It can also be made by reacting calcium hydroxide with potassium carbonate. The calcium carbonate precipitates and is filtered, leaving potassium hydroxide. It is used to make soap. It is also used in organic chemistry. It can be used to make fertilizers and other potassium compounds. It is used to make diesel from plants. It is used in alkaline cells and nicads as an electrolyte. It can be used to identify mushrooms. This page was last changed on 10 March 2017, at 16:13.